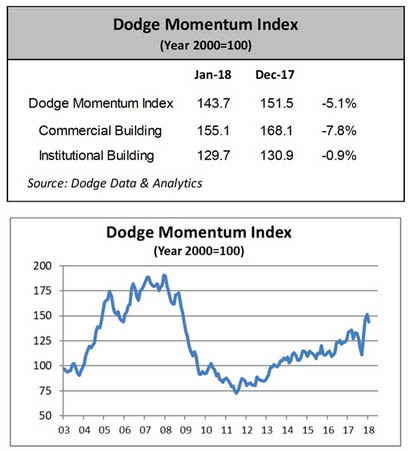 The Dodge Momentum Index dropped 5.1 percent in January to 143.7 from the revised December reading of 151.5. The commercial component of the Momentum Index was 7.8 percent lower in the month, while the institutional component was down 0.9 percent. The fourth quarter of 2017 was particularly strong for the Momentum Index, and January’s retreat returns it to a more sustainable level. In January, five projects each with a value of $100 million or more entered planning. For the commercial sector, the leading projects were a $200 million office building in Boston MA and a $152 million warehouse in Banning CA. The leading institutional projects were a $440 million water park in Branson MO and a $123 million assisted living facility in Milwaukee WI.